Thank you to everyone who contributed to this year’s 100,000 Thank Yous campaign! 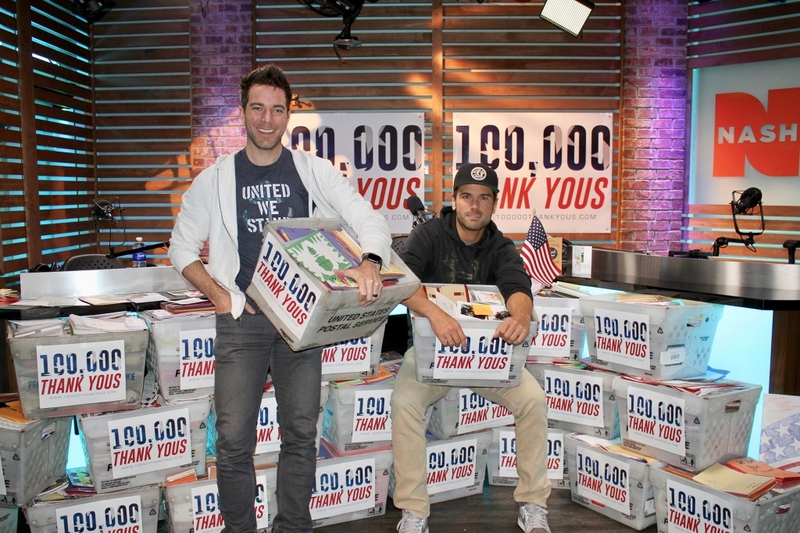 Thanks to your generosity, we received 209,433 thank you letters to send our troops this holiday season. Watch John Rich and Shawn Parr help us with the big reveal. We’ve extended the deadline to Monday, December 3, 2018! Please be sure to get your thank you letters in the mail in time for us to receive & count them toward the final total on December 3. WHAT IS 100,000 THANK YOUS? 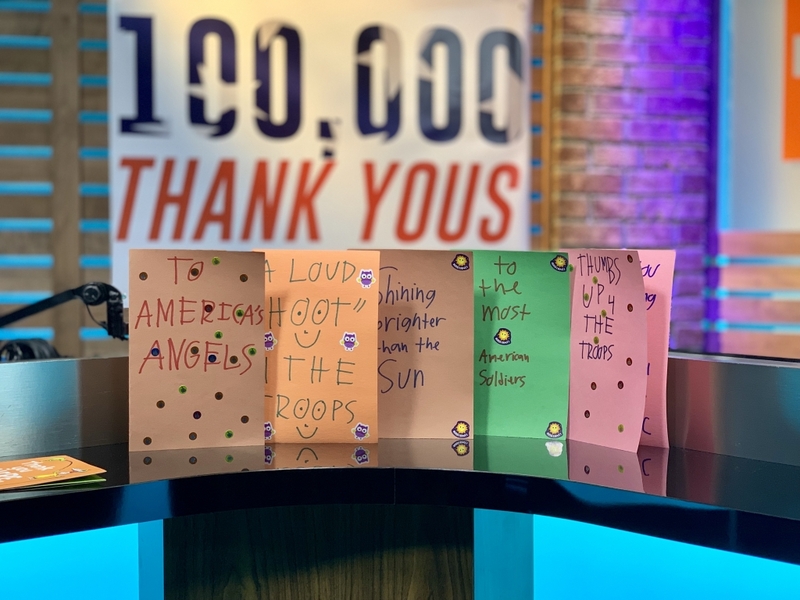 Ty, Kelly & Chuck are calling on YOU to create, collect and send 100,000 Thank You letters to our troops overseas during the month of November! Our troops are there for us 24/7… it’s YOUR turn to be there for THEM when they need it the most! Last year we collected over 175,000 letters to send to our deployed service members, and we can’t wait to do it again! It’s time to challenge your neighbors, church group, class or entire school, team, fraternity or sorority, Girl or Boy Scout Troop, and work office to start writing letters of thanks to our military! Start writing those letters! Get together with ANYONE you know to write letters of gratitude to our deployed service members and veterans. Mail all letters to 100,000 Thank Yous at 506 2nd Avenue S, Nashville TN 37210. 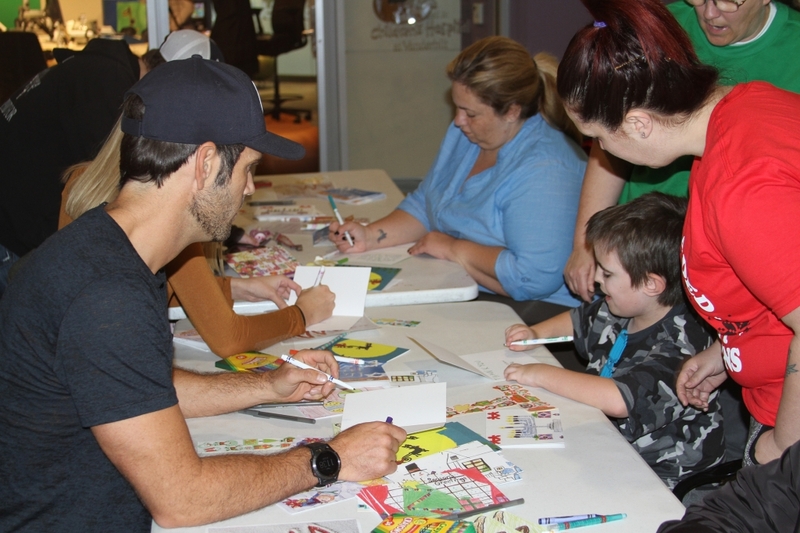 Chuck Wicks surprises patients and families at Vanderbilt Children’s Hospital making cards for our troops during last year’s 100,000 Thank Yous campaign. After you’ve written all those letters, send all of them bundled as directed below. Do NOT include envelopes when writing cards – it will only slow down the sorting! Bundle letters in groups (typically in groups of 25, 50, 100 or 250 is best for a large amount). Please add a note to the top of your letters noting how many are in each bundle! This will be a HUGE help while sorting and counting. Feel free to place all letters in a manila envelope for ease of shipping. Mail all letters to 100,000 Thank Yous at 506 2nd Avenue S, Nashville TN 37210. No physical or monetary donations will be accepted – please do not include these in your letters. 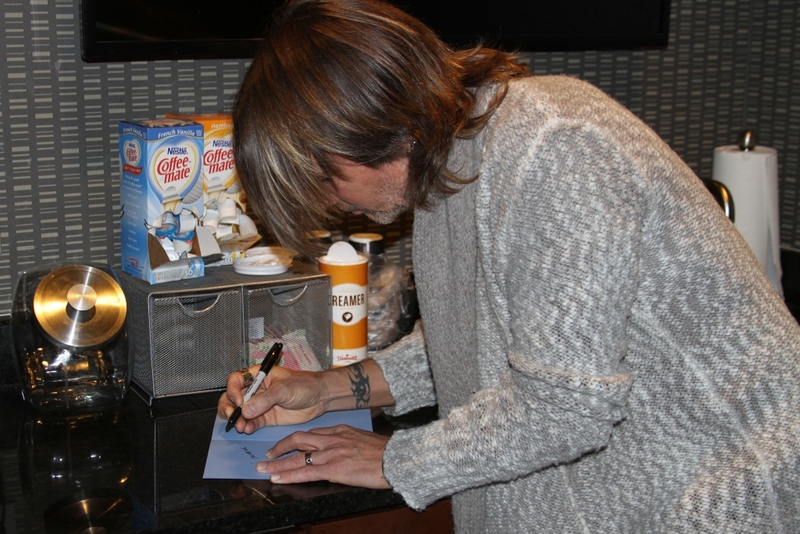 Keith Urban writes and signs a Thank You card for our troops during last year’s 100,000 Thank Yous campaign. Talk about things happening around home like the weather, sports, etc. 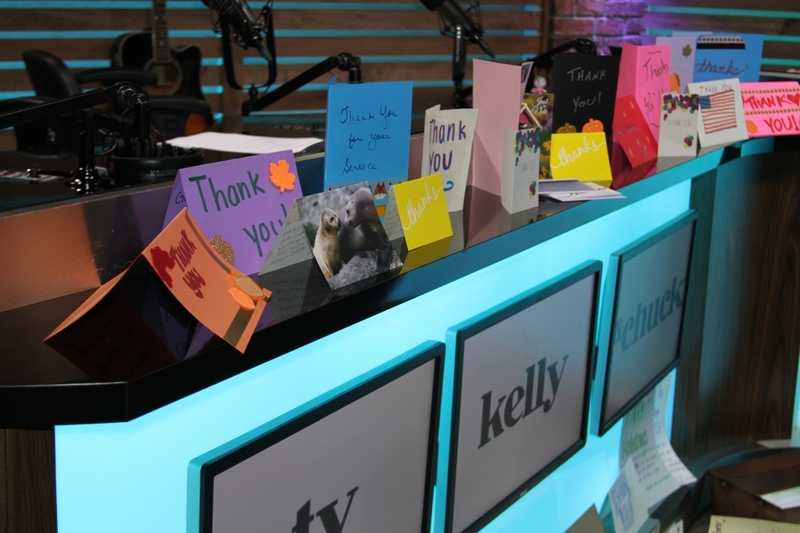 Click here to see great examples from last year’s 100,000 Thank Yous! Avoid making holiday-specific cards, as the troops will be sent letters throughout the year. Do NOT include envelopes when writing cards – it will only slow down the sorting! Buy a box of greeting cards, write a short note of encouragement to our troops and send them to us to be included in our packages. Fold a piece of paper in half and make your own card. We would love for schools, churches, and clubs to have their children spend a few minutes making cards. Are you and your group interested in helping Ty, Kelly & Chuck sort letters? Email mackenzie.cooper@cumulus.com! Through OPERATION S.E.N.D., Military Missions ships out 8,000+ care packages to troops deployed all over the world! Their care packages include personal care items, snacks, books, and (most importantly) YOUR cards! These packages get sent out year-round, so make sure your cards aren’t holiday-specific. The Military Missions team likes to include 10+ cards in each care package, so that adds up to a LOT of cards per year – we are so excited to partner with them to make sure deployed military members will receive cards throughout 2019!